What takes eight hours, a few drinks and several swear words? Three and a half cast on flowers. Three and a half flowers were all I had to show for myself. I am not certain I am 100% happy with them but I am moving on. 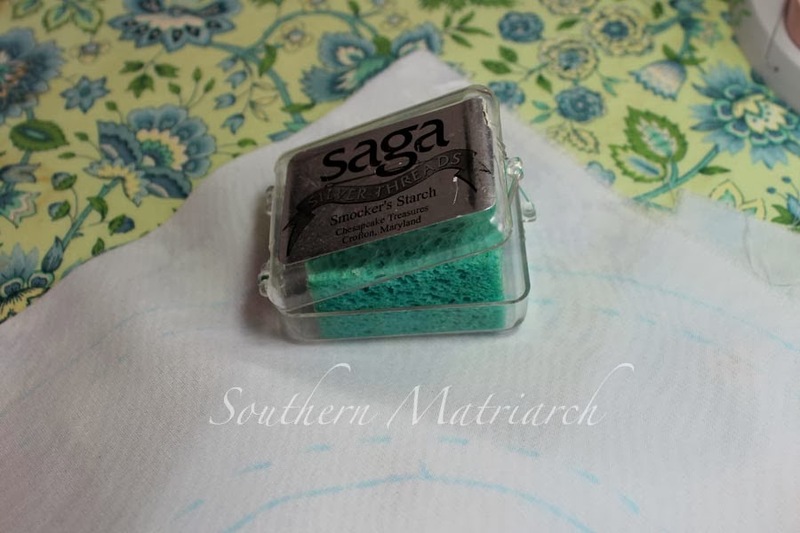 I did find a few tips that helped when working with the rayon thread. Rayon thread has a wonderful luster or shine to it. 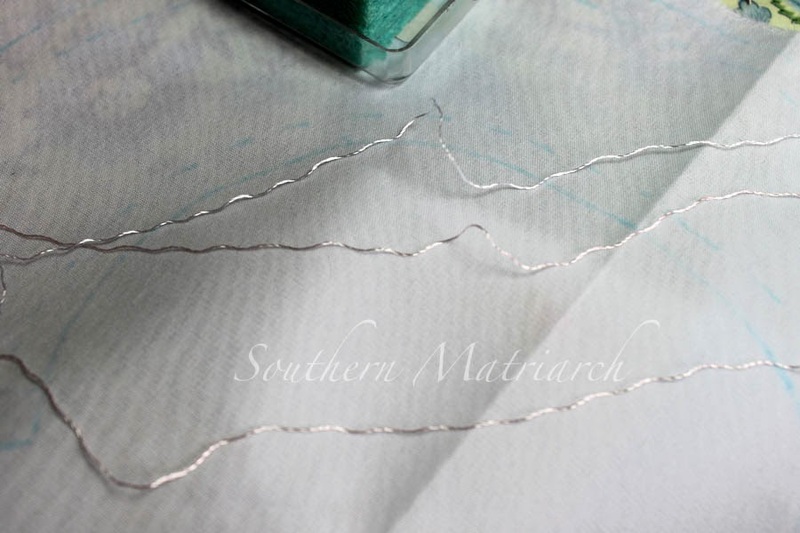 When used for smocking and embroidery, the stitches really reflect the light. That sparkle and shine comes with a price though. Having to handle and deal with the rayon thread. After a few fits and starts, it soon became the principle of the matter. I was not going to be defeated. Some people call me patient, it really is just a stubborn streak a mile wide. Here are the things I found that worked. Hopefully, they will help you too. 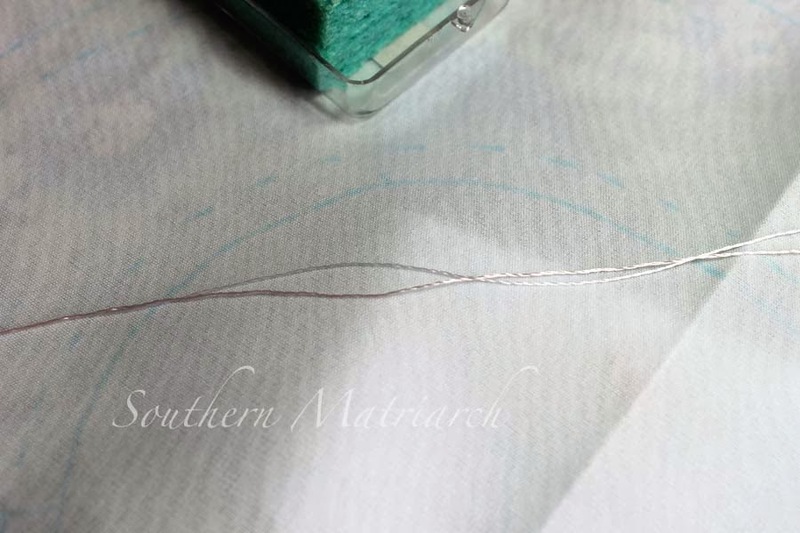 When you strip the rayon floss (separating the strands), you get a clue as to why it is a bit troublesome. See all those kinks and curliness? The fiber has quite a spring to its step. After a few missteps and some funky looking stitches I knew I had to try something different. Voila! Much smoother thread. Much less chance of knotting and tangling, thus much easier to work with. The difference between using the starch versus beeswax or Thread heaven is I knew it would be water soluble and rinse right away with next to no effort. If you don't have one of these handy things just purchase an old fashioned sponge, cut it into small pieces and store it in a left over plastic container. Let it dry out before you close the container up to store. Otherwise you might be surprised with a smelly, moldy sponge when you go to open it the next time. Another thing I did while working the flowers was leaving the tails quite long while I was handling it. I trimmed them to a more normal 1/4"-3/8" long tails when I was ready to construct my collar but wanted to wait until I was done working it in my hands before doing that. The threads unravels like it is its job! In addition to that I used, (shhhhhhh don't tell) a teeny spot of fray-check on the thread ends after I trimmed them. I only used a teeny teeny amount. And just on the thread ends, not on my garment piece. Just enough to knock down the chance of the end of the threads unravelling. No matter how many times I instruct Princess' momma to hand wash, this garment is going to find itself in a washing machine, I just know it. I need that thread to not come undone. Be VERY careful when getting fray-check anywhere near your project. It is NOT removable if you drip it on your garment. Another tip was making a few practice flowers after the first one I tried on my collar was a jacked up mess, as you can see on my traced collar piece. It helped to work out how the feel and performance of the thread was going to work. I know, most people hate practice stitches. So do I, but after I took the same flower out twice because I couldn't get it to work, I knew I needed to step back and re-think this. Ta-da, my first finished cast-on pansy flower. Eight hours later. The instructions "instructed" making all of the petals pink for this colorway. I felt a rebellious streak hit me and decided I didn't want to do them in all pink. This is for the collar of the jacket to accompany Princess' Easter dress. "Primrose" by Gail Doane. It is featured on the cover of Beautiful Bishops by Country Bumpkin. More to come on the Easter dress. Until next time, faithful reader. You're a braver man than I am Gunga Din !!! The result is beautiful. 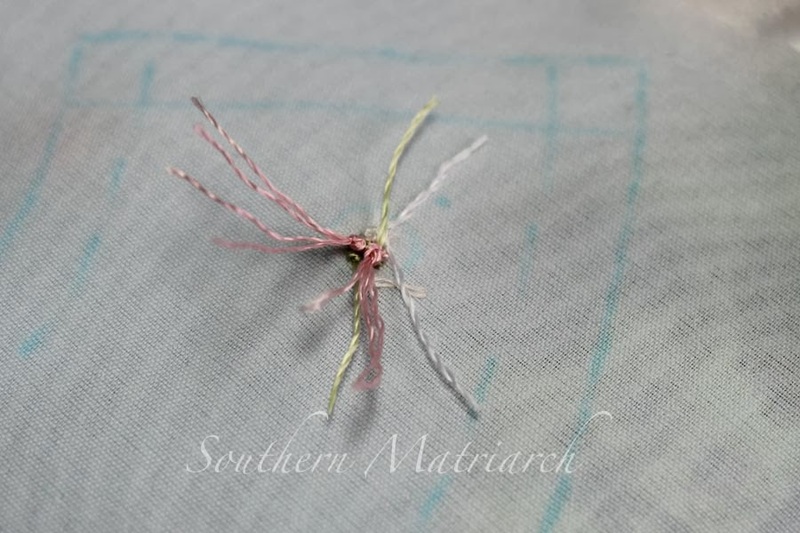 I have a simple solution to both rayon threads and cast on flowers. I don't do them. Period. I find something else. Nothing is that important. But as DawnB says, I admire your bravery and perseverance. Beautiful for sure and good on you for your perserverance. 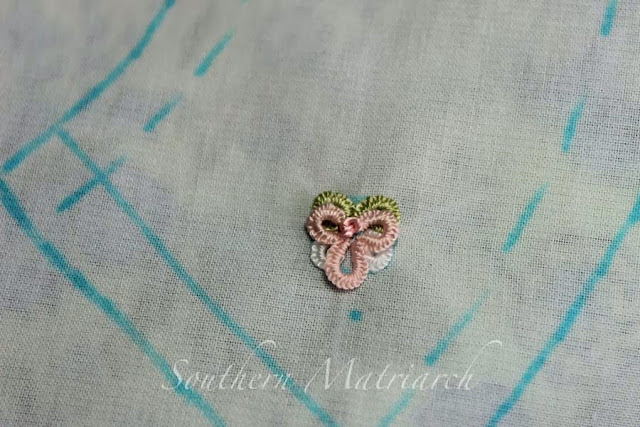 A tip that my smocking guild members told me was to use an old curling iron to straighten threads instead of a regular iron. The curling iron is much more portable as well. I will try the sponge plus starch idea next time. Martha...I am laughing and crying as I read this. 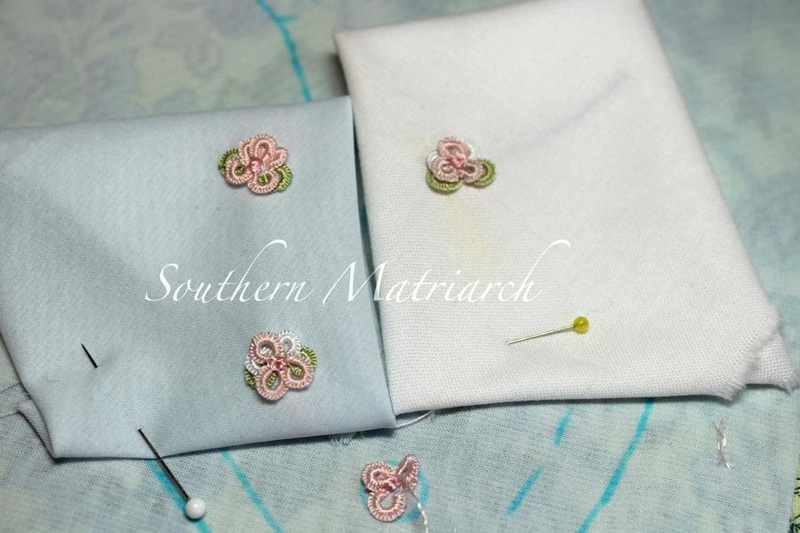 I too am working with 'rayon floss...cast on flowers, bullions, double cast ons...SO GLAD I am not the only frustrated sewista out here!!. 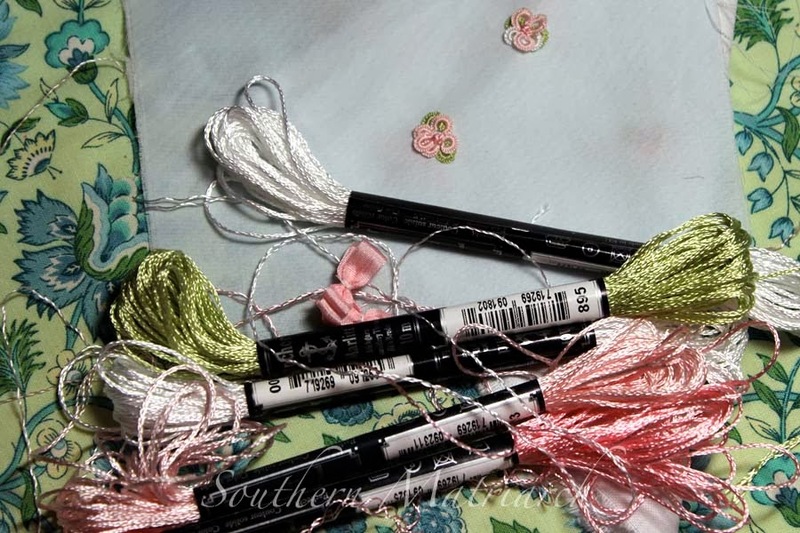 I am using Thread Heaven, because I am on 'silk..so it will have to stay dummed down for now. MY cast ons are a wonky mess...finally got one to go right. NOT cutting out the others..Thanks for voicing my frustrations...will remember the starch for another try. Amen to all if this! If you can find it Stop Fray (by Aileen's of the gold glue bottle) works well, is not caustic and is not as hard when it dries. I use it when i smock with rayon ribbon floss. I learned about rayon thread the hard way...Used it for my first bishop. I used an iron. Your sponge idea is so much easier. I should have kept at it... I gave up and moved on to perle cotton. Much better results for me. Thank you for the info...I always struggle with those beautiful threads.